McKee's 37 Marine & RV Final Step Detail Wax is a spray-on cleaner and wax in one! This unique formula is loaded with state-of-the-art, super slick polymers that encapsulate dirt, salt, and grime lifting them above the surface where they can be safely wiped away without scratching. McKee's 37 Marine & RV Final Step Detail Wax is enriched with high-grade carnauba wax that protects treated surfaces from UV rays, cracking and fading. Use Final Step Detail Wax on gel coat, paint, fiberglass, aluminum, chrome, decals, windows, countertops, appliances, and any other hard surface on or in your RV. • Use on fiberglass, gel coat, chrome, aluminum, decals, countertops, appliances, and more! Owning a boat or RV is a great reward for your hard work, so why would you want to work hard maintaining it? McKee's 37 Marine & RV Final Step Detail Wax simplifies your maintenance routine so that you can spend more time enjoying the open water, or the open road. This incredible formula cleans shines and protects all of the hard surfaces in and around your boat or RV and it's formulated to do so without streaks or smears so that you can enjoy a clean glossy surface without the headaches! McKee's 37 Marine & RV Final Step Detail Wax is so easy to use, you'll wonder how you kept your boat or RV clean before. 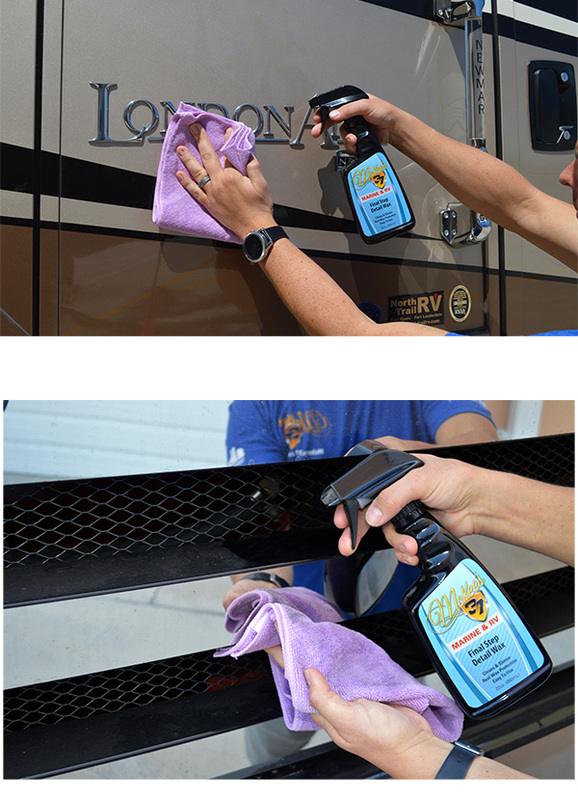 Simply spray it on and buff it off — that's all it takes to make your boat or RV look like you spent all day detailing it! McKee's 37 Marine & RV Final Step Detail Wax makes it easier than ever to quickly clean and protect your boat or RV. Clean, shine, and protect with just one application! 2. Spray a liberal amount of product directly onto surface and wipe clean with a plush microfiber towel. 3.Use a second clean, dry microfiber towel to buff the finish to a high gloss. McKee's 37 Marine & RV Final Step Detail Wax 128 oz. McKee's 37 Marine & RV Mildew RemoverMcKee’s 37 Marine & RV Mildew Protectant SprayMcKee’s 37 Marine & RV Water-Resistant Vinyl ProtectantMcKee’s 37 Marine & RV Gloss Enhancing Final PolishMcKee's 37 Marine & RV Hydro Pearl Sio2 CoatingMcKee's 37 Marine & RV All-In-One Fabric & Vinyl CleanerMcKee's 37 Marine & RV Carnauba Wash & WaxMcKee’s 37 Marine & RV Heavy Duty Cleaner WaxMcKee’s 37 Marine & RV Repel Glass & Plastic CleanerMcKee’s 37 Marine & RV All Purpose Surface CleanerMcKee’s 37 Marine & RV Bug Remover & Wax RestorerMcKee’s 37 Marine & RV Vinyl Decal & Graphic RestorerMcKee’s 37 Marine & RV Heavy Cut Oxidation RemoverMcKee’s 37 Marine & RV Carnauba Sealant WaxMcKee’s 37 Marine & RV One-Step Polish & SealantMcKee’s 37 Marine & RV Repel Glass & Plastic Cleaner 128 oz.McKee's 37 Marine & RV Final Step Detail Wax 128 oz.McKee's 37 Marine & RV Carnauba Wash & Wax 128 oz.McKee's 37 Marine & RV All Purpose Surface CleanerMcKee’s 37 Marine & RV Bug Remover & Wax Restorer 128 oz.